Landmines still pose a threat in 75 countries–most of which aren’t even at war anymore. In Cambodia alone, there are more landmines than people. More alarmingly, nearly half of all victims are children. Those who aren’t killed are condemned to live the rest of their lives with permanent and debilitating physical injuries—and little prospect. Already battling poverty and illiteracy, most of these children and their families will have an even harder time getting the medical help, rehabilitation, prosthetic limbs and funds they need to get them back to school and out of this vicious cycle. 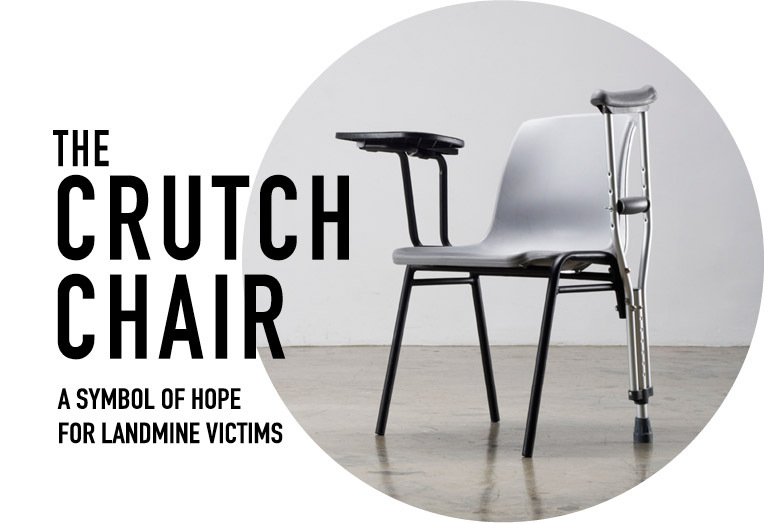 The Crutch Chair is a rally point for students and adults in a position to help. If you see this chair in your school or in an exhibition, share the idea and spread the word through #StandwithKanha #crutchchair on your social networks. Help these children take their first step towards a brighter future! Put yourself in the position of a landmine survivor!